New Yorkers know that it is the city government’s job to make sure that they’re taken care of. We fill potholes, pick up the trash, clean the streets, clear the drains, prune the trees - you name it. But that’s not all we do. And while we faced many challenges as a city and as a nation in 2018, New Yorkers continue to step up and help their neighbors in need. Through our public health facilities, tens of thousands of dedicated professionals help their fellow New Yorkers put food on the table, help expectant mothers get access to critical health care, help seniors make ends meet, and so much more. We even helped non-English speaking eligible voters participate in our democracy, by expanding our poll-site interpretation program. We work to serve New Yorkers every day because that’s our number one job. It’s why we’re here. Back in October, the Trump administration announced a proposal concerning “public charge,” a complex aspect of immigration law. If implemented, the proposal would make it easier for immigration officials to prevent an otherwise eligible person from getting a green card or certain kinds of visas. They could make that life-changing decision just because one day, the applicant could find herself or himself down on their luck and in need of important public resources. Over 200,000 public comments were submitted to the federal register – a truly remarkable display of civic participation and responsiveness from residents of all walks of life. We thank you, and every single New Yorker who took the time to make their voice heard on this issue. We can all agree that in this country – in this city – of immigrants, no one should have to choose between relying on the help for which they’re legally eligible and pursuing the American Dream. In the past few months, we’ve heard from folks across the five boroughs, some scared or confused, and even more who want to know how to help their fellow New Yorkers. So let’s get some facts straight. First: the public charge proposal is not in effect, and nothing about eligibility for benefits has changed. New York City’s doors remain open to those in need. The Department of Social Services is continuing to accept applications from all New Yorkers for benefits, and is continuing to deliver benefits and services to all who are eligible. The same is true for all of the public hospitals and community clinics operated by NYC Health + Hospitals. If you’re in need of health care, you’ll be able to find it there. Second: many immigrants would not be impacted by this proposal. If you are a naturalized citizen, a refugee, an asylee, or a green card holder thinking about renewing or becoming a U.S. citizen, this proposal would not apply to you. This is also true for many other categories of immigrants. That leads us to the next – and very important – point. Third: If you are concerned about this proposal’s possible impacts on you or your family, don’t make any decisions without getting safe and trusted legal advice first. You can get help in many languages by calling the Office of New Americans hotline, operated by Catholic Charities, at 1-800-566-7636. You can also call the city’s 311 and say “ActionNYC” to schedule a free consultation with a trusted immigration legal services provider, funded by the City of New York. If New Yorkers begin to disenroll from health care, nutrition, or housing programs for which they’re eligible, the consequences could be dire. We could face a public health crisis and lose hundreds of millions of dollars in economic activity annually. As public servants, our job is to serve you. And in the fairest big city in America, no one should struggle alone. We’ve got your back. Bitta Mostofi is the Commissioner of the Mayor’s Office of Immigrant Affairs; Steven Banks is the Commissioner of the Department of Social Services, City Council Member Carlos Menchaca is chair of the Immigration Committee, City Council Member Mark Levine is chair of the Health Committee, City Council Member Stephen Levin is chair of the General Welfare Committee. In December, several City Council members jostling to become the powerful next speaker of the 51-member legislative body signed on to a broad platform of reforms to the Council’s rules and procedures, which can have a significant impact on city law-making and funding for communities. Both returning and newly-elected Council members, 33 of them in total, backed the proposals, which would make legislative drafting procedures more transparent, bolster staffing for prominent divisions such as land use, and tweak the Council’s internal culture in significant ways, among other more minor adjustments. But a deadline set in that platform for convening a public hearing on the proposals came and went as new Council Speaker Corey Johnson, who was among the signatories, has chosen instead to implement administrative changes in lieu of more formal reforms through the Council’s Committee on Rules, Elections and Privileges. Several Council members who spoke with Gotham Gazette largely praised those measures but others expressed concern that important promises have been left unfulfilled. In a process somewhat similar to four years prior when Council members proposed changes ahead of the election of a new speaker, the document signed by the Council members in December of last year laid out broad areas where the Council could improve its functions, including in bill drafting, the role and operations of the 40-plus issue committees, the body’s oversight and investigations capacity, its budget negotiation process, its land use powers, and the quality of working life for members and their staff. By this time in 2014, then-Speaker Melissa Mark-Viverito had ushered in transformative rules changes that made the body more democratic, diluting some of the traditional powers of the speaker and empowering individual members. The changes were spearheaded along with Council Member Brad Lander, who she appointed to chair the rules committee and was instrumental in drafting the reforms. Discretionary funding -- also known as “member items” that are usually awarded by Council members to local nonprofits in their districts -- was equalized across Council districts, with additional resources allocated to poorer districts, and could no longer be a tool to punish members who might oppose the speaker, as Mark-Viverito’s predecessors had used it. A new bill drafting unit was created to aid Council members and speed up the legislative process, and other changes were made to how bills are introduced and heard in committees. Johnson has taken a different tack, making significant administrative changes that cover large parts of the rules reform package and were key pledges he made as he ran for speaker. The Council voted to significantly increase its own annual budget to $81.3 million, up from $64 million, with the new funds pegged for staffing increases in the land use, legislative, and finance divisions. A dedicated 15-member oversight and investigations unit was created to conduct systemic analyses of city agencies and their functioning. According to a Council spokesperson, the central staff has also internally overseen improvements in bill drafting, no longer allowing indefinite delays on bill introductions and impressing on members to move their bills or release them for others. Members can now also electronically access the status of their bills in real time and there is a timely process for staff to express legal concerns with bill language. Members are provided legal memos on their bills on request, which is apparently rare. All moves meant to address major areas of frustration for some members, though key pieces of proposed changes to bill-drafting have not been implemented. In the wake of the #MeToo movement, the Council also moved rapidly to change its rules to mandate anti-sexual harassment trainings. When asked for comment, a spokesperson for Council Member Koslowitz (pictured), chair of the rules committee, initially said the Council member was unfamiliar with the rules reform package that she had signed. When presented with the full list of proposals, the spokesperson declined to comment. By and large, Council members are appreciative of the steps Johnson has taken. 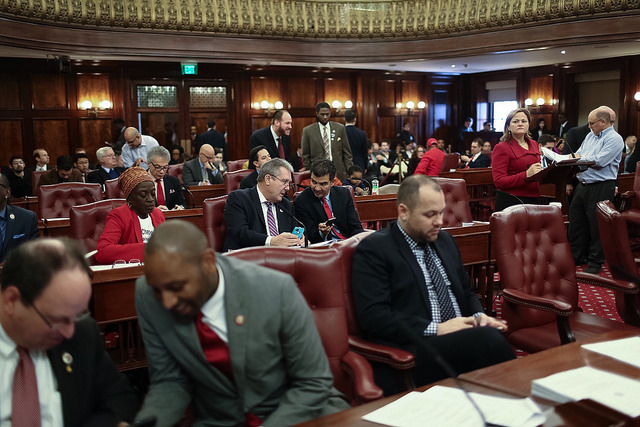 Several members said their bills are moving faster and, without making any comparisons with Mark-Viverito, that Johnson is openly seeking member input on the budget and larger strategy. At the same time, some members declined to comment, taking a wait-and-see approach before they evaluate Johnson’s commitment to rules reform. Others only agreed to speak anonymously, fearing what they say is increased scrutiny of public comments by the speaker’s office. Those members pointed out, for instance, that though there have been changes to bill drafting, the process still falls largely to the discretion of the speaker’s central staff. Under a long-standing process, Council members who made “first-in-time” legislative services requests -- Council speak for when a member asks for a bill to be drafted -- were given priority even if other members may have similar bill requests. Having a “first-in-time” request meant that members could sit on bills indefinitely, which the rules reforms would have amended with an official time-bound process. A Council spokesperson said that practice has ended and that members have offered positive feedback for the changes that have been made. Members are no longer allowed to sit on bills, and lose them to other members, the spokesperson said, without providing the details of how the new protocols work. Council members who spoke to Gotham Gazette seemed to be in the dark about whether rules reforms were even being discussed. The overarching platform hasn’t been discussed in hearings though some of the issues have been raised in the Democratic conference meetings, said one member who would only speak on the condition of anonymity. Though the Council allocated more money for pay raises for staffers, it hasn’t implemented pay parity with other city agencies where benefits are better and salaries are higher, despite that being a priority outlined in the draft of reforms. “Yeah, I would add that to the list,” the Council member said. Nor is childcare provided to members or staffers, as called for in the reform proposal. The Council spokesperson noted that audio induction loops for those with hearing impairments were added last year and that language accessibility can be requested. The spokesperson also said that pay parity has been discussed with members when the Council was deciding its own budget, and ultimately members get to decide how they will use the increased funds budgeted for their offices and staff. The spokesperson also acknowledged that the Council does not currently provide childcare options but insisted that the Council is always looking at ways to expand it for all New Yorkers. Echoing Lancman, Levine said a formal hearing wasn’t absolutely necessary. “These changes have been possible through a combination of changing internal procedure, through allocation of resources, and that really is a very big deal,” he said. Some members are waiting until after budget negotiations have concluded with the administration to see more changes go into effect, particularly with new funding at the Council’s disposal. Cornegy said he wants to see “a bit more latitude” for members in the drafting process so bills can move more quickly. Among other items that remain unfinished are changes to the functioning of the Council committees, which hear bills and hold oversight hearings. Camarda also pointed to a New York Post report from May that highlighted Johnson’s partial reversal on a promise to regularly publish his full public schedule and details of his contact with lobbyists. “We hope this isn’t the beginning of a trend that the speaker’s promises on good government issues go unfulfilled,” Camarda said. Mark Levine and Carlina Rivera are members of the New York City Council. Levine chairs the Council’s health committee, Rivera chairs its hospitals committee. On Twitter @MarkLevineNYC and @CarlinaRivera. Last week, the City Council proposed a legislative package aimed at confronting sexual harassment in private and government work environments. It includes 11 bills, four of which would apply to city agencies should they become law. 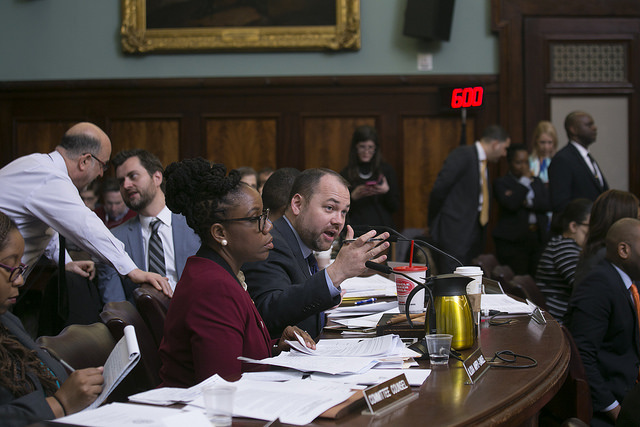 Council members sponsoring the bills, including Speaker Corey Johnson, touted the legislation as evidence of the Council taking significant action toward preventing and punishing the type of harassment that has become the focus of a national movement. But the bills do not apply to the City Council itself. 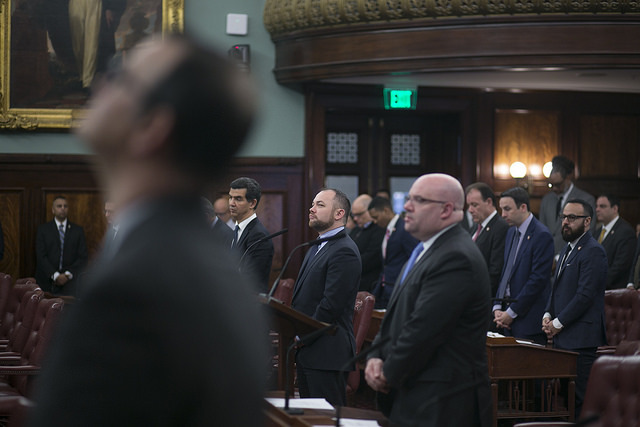 There was also some confusion among the bill-sponsoring Council members and in the speaker's office as to whether the bills applied to other non-mayoral government entities such as the offices of the Comptroller, Public Advocate, or Borough Presidents. After this article was originally published, a Council spokesperson clarified that "The legislation as it is written will cover non-mayoral government entities, including the offices of the Comptroller, Public Advocate, or Borough Presidents. The Council will be covered through a rule that will be drafted to ensure compliance." When originally asked about the omission of the Council and other non-mayoral entities in the legislation, a City Council spokesperson said that the Council is in the beginning stages of the legislative process, the bills may change, and that the Council will adhere to the laws they pass. There was no discussion of the Council’s own policies at the hourslong hearing on the bills held February 28 at City Hall. 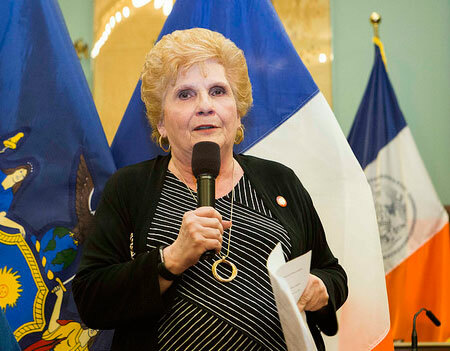 A spokesperson for Council Member Helen Rosenthal, who chairs the Council’s Committee on Women, told Gotham Gazette that the process is in its early stages, insisted the Council would comply with the practices in the new laws, and said that many of the provisions in the bevy of bills are already the Council’s policy, such as the provisions included in Johnson’s bill. A spokesperson for Adrienne Adams also said the Council was early in its process and “intended to comply” with the legislation. A spokesperson for Mark Levine did not respond to requests for comment. Last year, Levine announced plans to introduce legislation that would designate Council staff complaints as the purview of the Council’s Standards and Ethics Committee, which currently only has oversight of elected Council members. The proposal has yet to make it into bill form. For the several hundred employees of the City Council, the body’s own harassment policies and procedures are not public and Gotham Gazette is still awaiting the results of a Freedom of Information Law request for information regarding how harassment complaints are handled and how the Council’s equal employment committee (EEC) functions. When it comes to handling complaints at the Council, sources indicate that there is a process for making and evaluating complaints through the EEC. Elected Council members themselves, are subject to the Committee on Standards and Ethics, made up of Council members, which evaluates complaints and can adjudicate punishment, as it recently did with Council Member Andy King, who was assigned additional training after a complaint of undue attention to a staff member was substantiated. The bills will likely be changed before they are voted through committee and then the full Council, but to what extent remains unclear. It was also unclear whether the offices of the Comptroller, Public Advocate, and Borough Presidents were aware of their inclusion in the legislation. When asked about their exclusion, working from apparently incorrect initial responses from the Council, those offices sent the following replies. A spokesperson for Comptroller Scott Stringer declined to comment regarding the Council leaving itself out of the legislation, but provided Gotham Gazette with the office’s policies and procedures on sexual misconduct. A spokesperson for Public Advocate Letitia James did not respond to a request for comment. A spokesperson for Bronx Borough President Ruben Diaz, Jr. told Gotham Gazette, "Our office has a comprehensive sexual harassment policy that reflects the policies published by the Department of Citywide Administrative Services on the issue." A spokesperson for Queens Borough President Melinda Katz said they had to review the legislation before commenting and that the office has existing policies in place for sexual harassment. A spokesperson for Manhattan Borough President Gale Brewer declined to comment on the legislation. A spokesperson for Staten Island Borough President James Oddo also declined to comment on the legislation, but told Gotham Gazette the Borough President’s office follows the procedures used by city agencies and has both a male and female Citywide Diversity and Equal Employment Opportunity (EEO) officer. Note: this story has been updated in several places based on new information provided by the City Council after the story was originally published. H+H is a public-private corporation that manages the city’s 11 public hospitals, health centers, and municipal healthcare provider, MetroPlus. “Its mission is to provide quality, comprehensive health services to all New Yorkers, regardless of their ability to pay,” Rivera said. “In effect, Health + Hospitals is the default system of care for Medicaid patients, the uninsured, and other vulnerable populations, and is integral to our system of safety net hospitals.” Rivera noted that approximately 70% of H+H patients are uninsured or on Medicaid. H+H has faced numerous fiscal challenges over the past few years. When the original One New York report was released in 2016, its intention was to reduce an anticipated budget deficit of $1.8 billion in fiscal year 2020, which begins July 1, 2019. A recent fiscal scare originating in the federal government concerned the potential defunding of the Disproportionate Share Hospital program, which provides additional funding for hospitals that see a disproportionate number of low income patients, who may be uninsured and/or on Medicaid. The threat of cuts, which has loomed since 2014 but has become especially acute since President Donald Trump took office, was averted for the immediate future with a recent two-year extension of funding in the latest federal stopgap measure passed in February. When the cuts take effect, federal and state funding is expected to drop by approximately $800 million. Meanwhile, after H+H announced plans to file a lawsuit against New York state government for failing to provide $380 million in funding, Governor Andrew Cuomo relented, giving H+H $360 million of the $380 million H+H claimed it was owed in October. Cuomo had initially suggested that the city tap into its reserves to provide the funding. Tellingly, Katz, who assumed his current role after leading the Los Angeles County Health Agency for seven years and turning a $250 million budget deficit into a $560 million budget surplus, did not focus his City Council testimony on short-term revenue streams coming from Albany and Washington but rather on what he assesses are deficient practices within H+H operations and bureaucracy that are hindering its ability to collect revenue to its full potential. Katz outlined a seven-point plan to increase revenues without cutting vital services. It includes cutting administrative expenses, which Katz said has begun recently by eliminating outside consultants from the system to the tune of $16 million in savings, and investing in new “revenue generating positions” such as primary care doctors, pharmacists, and nurse practitioners instead of solely ER doctors, a goal Katz outlined at the beginning of his term. But perhaps the more significant stabilization schemes, which were the focus of more attention at the hearing, relate to reforming H+H’s billing processes and bringing more insured patients into the system. Because H+H has a reputation as the hospital network that serves the indigent, many insured people do not use municipal hospital services. As a result, Katz said there is a substantial amount of bureaucratic waste within the system due to poor administrative skills on the part of system workers, who normally work with people who are either uninsured or on Medicaid. This point was hammered by Council Member Antonio Reynoso, who recently became a father and described his experience as an individual with private insurance at Woodhull Hospital, an H+H hospital “across the street” from his district. Reynoso effusively praised Woodhull’s maternity ward and other services, but chastised billing procedures as inefficient. Katz agreed that H+H needs to develop better billing procedures, including diagnostically coding bills correctly, checking insurance cards, checking prior authorization, and better communication with insurance companies. He cited a skilled nursing facility that spends roughly $21 million on drugs but only has revenues of $5 million. “That’s impossible,” Katz said, “because we’re talking about skilled nursing facilities where there are almost no uninsured patients.” Katz claimed that the $21 million was a fair market value for the drugs but that the significant revenue shortfall had its roots in poor billing practices. The situation at the skilled nursing facility is only the tip of the iceberg. In response to a question from Rivera, H+H Chief Financial Officer Plachikkat Anantharam stated that H+H lost between $130 million and $290 million in 2017 as a result of chronic underbilling. Further, Katz said that H+H should not be referring patients out of the system and into the private market. Via MetroPlus insurance, H+H by proxy essentially pays private hospital operators to provide care, resulting in a significant amount of lost revenue. Katz also stated that H+H needs to begin offering services that are “well reimbursed.” He illustrated this point by comparing behavioral health, for which H+H is the largest provider in the city and which is “poorly reimbursed,” and angioplasties, a heart procedure that is well reimbursed by insurance companies, but is rarely performed by H+H, and only at Bellevue Hospital. Katz also wants, as part of his plan, to “convert uninsured people who qualify for insurance to be insured,” whether through Medicaid or MetroPlus, the government sponsored health insurance provider wholly owned by H+H that insures around a half-million New Yorkers and is offered on the Affordable Care Act exchange. Katz identified 250,000 people in the city who are uninsured but qualify for insurance coverage, out of a total of 667,000 uninsured people in the city. Regardless, the Council members and Katz acknowledged that signing up tens of thousands of people for insurance is easier said than done. Council Member Mark Levine, chair of the Council’s health committee, asked whether it was possible to enroll patients who walk into a facility on the spot, and why this hadn’t been done in the past. “No, Council Member, I think you’re right, and accurate. It’s both of those things,” Katz responded. Katz cited his experience in Los Angeles as evidence that the public hospitals system could be stabilized without attrition, or mass firings in other terms. Indeed, as Citizens Budget Commission noted in its analysis, "Lessons from La La Land," previewing Katz's takeover at H+H, "The good news was all on the revenue side." Reynoso was particularly fond of that line. “Grow out of a financial problem, that’s a great way to put it,” he said. 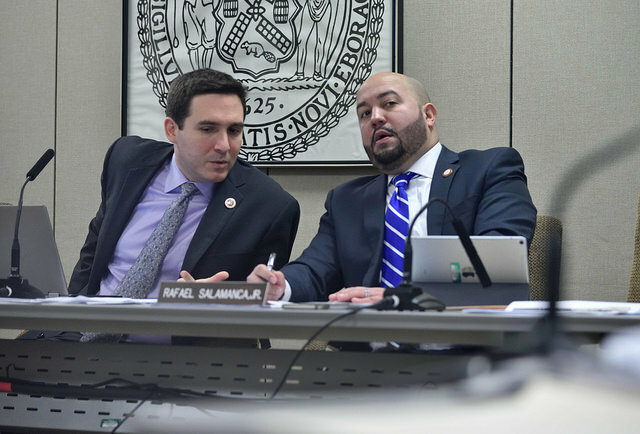 When new City Council Speaker Corey Johnson reshuffled committee portfolios earlier this month, Council Member Ben Kallos lost his position as chair of the Committee on Governmental Operations. Sources say the move was punishment for Kallos’ approach to Board of Elections commissioner nominations and because of his support for one of Johnson’s opponents in the speaker race. By virtually all accounts, Kallos had done an exceptional job chairing the governmental operations committee during last legislative session, from 2014 through 2017. He led the way on a slew of reforms to campaign financing, government transparency and accountability, and was viewed by good government advocates as a valuable partner on the Council. He was praised by many, and snickered at by some, for his independence. But, with the election of Johnson as speaker, committee portfolios would be changed, with significant influence from the Queens and Bronx Democratic county organizations, which gave Johnson the backing he needed to ascend to what is arguably the second-most powerful position in city government behind the mayor. Kallos, who multiple sources say wanted to keep chairing the committee, was among a small number of members left out in the cold. 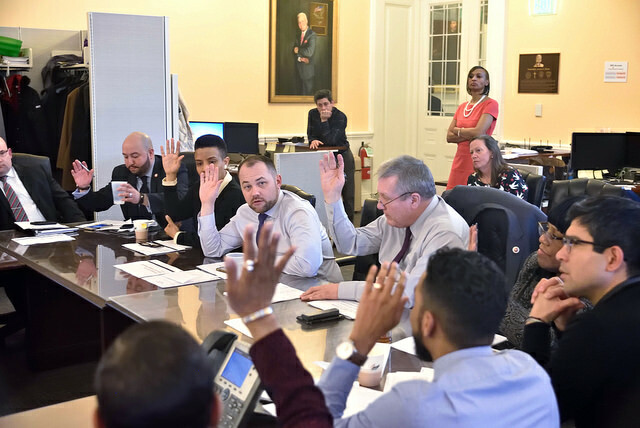 His committee chair position went to another member, Council Member Fernando Cabrera of the Bronx, and Kallos was instead assigned to lead the Subcommittee on Planning, Dispositions, and Concessions, which falls under the land use committee. He was named as a member of the governmental operations committee, among others. Kallos declined multiple requests to comment for this article. The Committee on Governmental Operations has a broad purview, overseeing several city agencies including the Department of Citywide Administrative Services, the Campaign Finance Board, the city Board of Elections, the Office of Administrative Trials and Hearings, and the Law Department, among others. The committee also has oversight of the city’s 59 community boards. As chair, one of Kallos’ priorities was to reduce patronage hires at city agencies, particularly the Board of Elections, a bipartisan body where positions are filled by the county organizations for both parties. Patronage, Kallos said, invariably leads to conflicts of interests and the appointment of subpar employees. The BOE’s ten commissioners -- one from each party in each borough -- are nominated by the county committees and confirmed by the Council. The commissioners play a crucial role in deciding who gets to be on the ballot in elections and in interpreting state election law. In 2016, Kallos was among those members who rankled the Bronx Democratic County Committee, led by Assemblymember Marcos Crespo, by insisting that a nominee for Democratic commissioner from the Bronx be required to give up her registration as a lobbyist in order to be confirmed as an elections commissioner. The nominee, Rosanna Vargas, initially refused but later relented. Vargas is now the president of the Board of Elections. “The Queens and Bronx county committees felt that Council Member Kallos wasn’t a team player with regards to BOE appointments,” said one source with knowledge of internal county party dynamics, when asked about Kallos losing his committee chairmanship, and speaking only on the condition of anonymity. Council Member Cabrera told Gotham Gazette that while he did not push to chair the governmental operations committee, he was “excited” to be offered it. “There were different options that were being put forth, but as soon as it was presented to me, I said that I was very eager to do so,” he said at City Hall recently. Cabrera did not serve on the committee in the last term but was co-sponsor of a few bills under its purview. He said he sees “eye-to-eye” with Kallos. Asked if Kallos was punished for opposing the Bronx County’s BOE pick in 2016, Cabrera pleaded ignorance. “To be honest with you, I have no knowledge, I don’t even know what you’re really referring to, honestly,” he said. The subcommittee Kallos now chairs feeds the land use committee now being chaired by Council Member Rafael Salamanca of the Bronx, an appointment by Johnson perhaps most indicative of the rewards provided to the county for its support of his speaker bid. Kallos was a known supporter of Council Member Mark Levine’s bid for the speakership of the Council. Levine was among the frontrunners for the post, but was unsuccessful after the Bronx and Queens County Democrats coalesced around Johnson, who gained the backing of those vote-rich counties in part because he had also secured individual support from about ten other Council members, according to Johnson. Asked about the decision to give the chair position to Cabrera, Council communications director Robin Levine referred Gotham Gazette to Johnson’s remarks at a January 11 news conference immediately after the new committee chairs were voted on by the full Council. She did not address a question about whether Crespo wanted Kallos removed from the position. “I was really trying to make everyone as happy as I could, by being as flexible as I could, by being as creative as I could and to try and give different people avenues for leadership and avenues to work on issues that matter to them,” Johnson said. One Council member, who asked to remain anonymous to speak freely about the committee appointments, said Kallos was a victim of a combination of factors. “I think it was an accumulation of the running into the counties on BOE, running up against Corey in the speaker’s race, and he’s also got some very complicated land use stuff in his district as well. Probably didn’t help this matter either, he’s seen as very anti-development,” the Council member said. But, the Council member added, “He could have fared worse.” Indeed, some other Council members who opposed Johnson’s bid or supported his opponents appeared to come away with less. Among those were Council Members Brad Lander and Jumaane Williams, neither of whom was given a committee chair position after having led the rules committee and the housing and buildings committee, respectively, in the last term. Lander did retain his position as Deputy Leader for Policy. 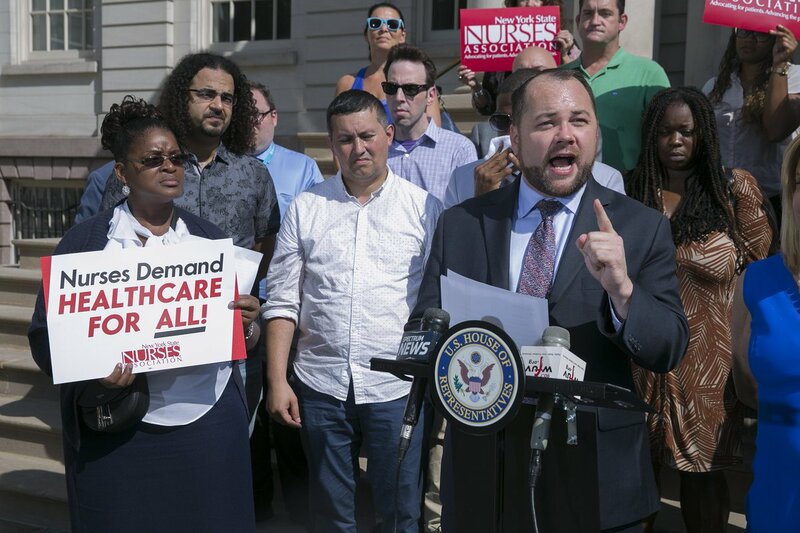 Before being elected Speaker of the City Council, Council Member Corey Johnson led the Committee on Health for four years. Drawing from his own personal experience as an openly gay, HIV-positive man who has struggled with drug and alcohol abuse and tobacco use, he pushed a raft of legislation to improve healthcare services and outcomes for many of New York’s most underserved populations. In his early days as Speaker, Johnson has indicated that health and healthcare issues will continue to be one of his main priorities over the next four years. At the same time, though, as he takes on his larger role Johnson has in some ways passed the torch to other Council members who will lead relevant committees related to health and oversee the city’s public hospital system, which is in the midst of a financial crisis that Johnson has been tasked with helping to monitor over the past four years and will now, as speaker, have even greater responsibility for as he negotiates the city budget with Mayor Bill de Blasio. Among the first steps that Johnson took upon assuming his new leadership position was to create a new committee, chaired by Council Member Carlina Rivera, dedicated to hospitals, especially New York City Health + Hospitals, the city’s municipal hospital system that has long suffered from budgetary difficulties and struggled to remain afloat even as the de Blasio administration has sought to overhaul its finances. Johnson’s move was a clear recognition of the H+H crisis, one that Council members, the mayoral administration, and healthcare advocates agree must be addressed amid threats of federal funding cuts to the city. The move to make the new committee also comes in conjunction with the beefing up of the Council’s oversight committee, now led by Council Member Ritchie Torres, and a repositioning of the health committee, under new chair Council Member Mark Levine. 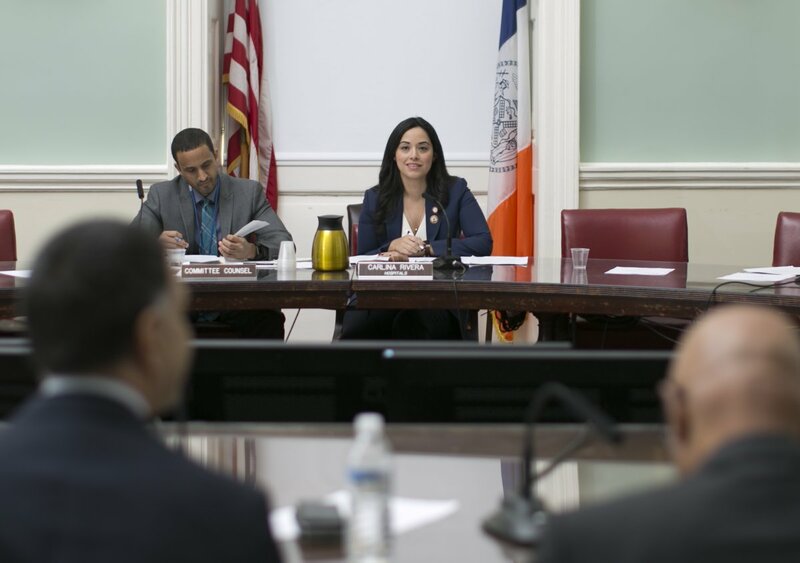 Levine, taking over the health committee from Johnson, will be able to focus his efforts closely on oversight of the city’s health services and to advance legislation expanding equitable access to healthcare for New Yorkers. There is some discussion among the parties of a city-run single-payer health care system, but it is unclear how far down this road Johnson, Levine, and others may go. Over the four-year course of the last Council session, Johnson’s committee held 62 hearings, passing 34 bills that became law. Johnson was the prime sponsor on 11 of those bills, which included new regulations on tobacco products and electronic cigarettes, mandated air quality surveys by the city, new animal safety protections, required reporting on health services in city jails, and allowing individuals to change their gender designation on their birth certificates. The committee also conducted broad oversight of the city’s hospital system, healthcare services provided by city agencies, and the city’s efforts to enroll people under the Affordable Care Act. Naturally, Johnson raised many of the same issues during separate Council hearings to examine de Blasio’s budget proposals over the years. His advocacy also extended beyond the Council’s work: he was arrested in Washington D.C. in July of last year while protesting the Republican-led Congress’ (so-far unsuccessful) efforts to repeal the Affordable Care Act. “He believes really strongly in universal health access and he talks a lot about the importance of single-payer,” said Claudia Calhoon, director of health policy at the New York Immigration Coalition, discussing Johnson’s record as health committee chair. Johnson’s support of implementing a single-payer healthcare system in the city could only be achieved through collaboration with the state, as Calhoon noted. “It’s really great to have leadership talking about that when you’re trying to advocate for closing gaps and trying to engage the city in doing the work to close the gaps as they are able,” Calhoon said. In particular, Calhoon praised Johnson’s efforts to create the Access Health NYC initiative, which, starting in 2016, provided funding to community-based organizations for health education and outreach efforts, particularly for underserved communities. “I think he has a very good vision for equity which flows into a lot of different areas,” Calhoon said. Johnson has spoken openly about coming of age in the 1990s and watching how treatment of the AIDS-HIV epidemic was handled, and about discovering his HIV-positive status and the need for medication and good health care. He represents a district largely made up of Chelsea and the West Village that was and continues to be home to much of LGBT activism, including around equitable health care. Elizabeth Adams, director of government relations at Planned Parenthood of New York City, praised Johnson’s work in holding city agencies accountable for sexual and reproductive health services, particularly abortion access for young New Yorkers, and to expand health care to immigrants. “During a time of increased federal attacks on abortion and rollbacks of funding for healthcare, it’s really really critical that New York City is examining its own care options and leads the nation in accessible and affordable health care, including abortion,” Adams said in a phone interview. Taking over the health committee, Council Member Levine has expressed support for issues that Johnson has championed, but he has yet to lay out an agenda of his own. “We are still in the midst of reviewing all the policy issues before the committee, still in the midst of forming our legislative priorities,” he told Gotham Gazette at City Hall last week, not long after being named to chair the committee. As Levine noted, perhaps the most significant area of oversight for the health committee has now largely fallen to the newly created Committee on Hospitals, under Council Member Rivera. “Health + Hospitals, it can’t be overstated how important it is to the fabric of the city,” said NYIC’s Calhoon. The system -- comprised of 11 hospitals, six neighborhood health centers, five nursing facilities and more than 60 community and school-based health centers -- mostly treats patients on Medicaid or who are uninsured, including many undocumented immigrants. In fiscal year 2017, the system treated more than 1.1 million patients according to the Mayor’s Management Report, of which nearly 415,000 were uninsured. But the system faces a projected budget gap of $1.8 billion by 2020. In the current fiscal year ending June 30, the de Blasio administration expects to spend $897 million on the system, of which $784 million will come from the city’s coffers and the rest from state and federal funds. Those costs are only expected to grow over the next few yearsn. Johnson, Levine, Rivera, and other Council members, including new finance chair Danny Dromm, will now lead budget negotiations with the administration. While the de Blasio administration has put in place a plan to reinvigorate the municipal hospital system, any progress that has been made is threatened by federal funding cuts. The city, and state, have long braced for reductions in Disproportionate Share Hospital payments from the federal government, which help reimburse hospitals for providing healthcare to low-income and uninsured patients. The DSH cuts went into effect in October last year, further exacerbating a trend of decreasing investment from the federal government that city officials have repeatedly cited. At the same time, Mayor de Blasio has repeatedly promised that the city will not shut down any municipal hospitals. “The hospital facilities are going to stay open. We’re also going to constantly look at how to use them better because the previous uses in many cases weren’t working and a lot of them were outmoded,” he said at an unrelated December 12 news conference. In that vein, the new president of Health & Hospitals, Dr. Mitchell Katz, who took over earlier this month, has said he will focus the hospital system more closely on primary care while implementing certain cost-saving and efficiency measures. Rivera agreed that the creation of her committee “does lend an urgency to the issue,” a point echoed by advocates. In a statement on Tuesday, Rivera noted the numerous challenges that H+H faces, including “closing Health + Hospitals’ growing budget deficit and updating hospital facilities for modern usage, to increasing access and support to community-based clinics." Planned Parenthood’s Adams acknowledged that though Johnson had worked to ensure adequate oversight and accountability at public hospital facilities, that much remained to be done. “It’s really exciting to see this committee be formed and really dig into how to strengthen and support healthcare options and availability of health options to all New Yorkers, regardless of income or immigration status,” she said. Beyond Health and Hospitals, however, Adams and Calhoon noted a number of policy areas where they hoped to see renewed energy from the Council. Both said the city needs to expand support for community health organizations through Access Health NYC. Adams said the city needs to prioritize abortion access at H+H, expand free-of-cost contraceptive coverage, and improve sexual health education in city schools along with ensuring that school-based health centers have the resources to provide comprehensive care to students. “Given all the public attention to sexual assault and sexual harassment, and bullying of LGBT students, we’re in a moment where we need to really be examining our health education program and putting in place comprehensive K-12 sexuality education,” Adams said. Its system of appointments based on political patronage has long been a source of criticism and its mismanagement of election operations has frustrated voters and been the subject of City Council oversight hearings. But, when asked, the eight men vying to become the next Speaker of the City Council recently said concerns about the BOE are misguided. To varying degrees, they indicated that the board is effective and efficient, that its failings are isolated rather than systematic, and that its current structure should be preserved. At a November 20 speaker candidate forum hosted by Citizens Union, other government reform groups, and New York Law School, seven speaker candidates -- Corey Johnson, Mark Levine, and Ydanis Rodriguez of Manhattan; Donovan Richards and Jimmy Van Bramer of Queens; and Robert Cornegy and Jumaane Williams of Brooklyn -- were present and they mostly took the middle of the road when asked about the steps the City Council, which approves appointments to the BOE, could take to improve the board. The ten BOE commissioners include two -- one Republican and one Democrat -- from each borough. The Council members hedged their bets and praised the BOE, recognizing that any criticism could potentially be read as directed toward the county party organizations that nominate BOE commissioners and place other employees at the board -- the same county organizations whose support each candidate is seeking in order to become speaker. The eighth candidate, Ritchie Torres from the Bronx, would later give Gotham Gazette a similar response. None of the members were in favor of a non-partisan restructuring of the board. “That’s a tough question to ask of speaker candidates,” Williams said, to laughter from his colleagues in acknowledgement of the role of the county party machines in both picking BOE commissioners and picking the Council speaker. Williams defended the board but did acknowledge that patronage has played a role in appointments and that the Council could do more to improve it. Other candidates spoke generally about reforming election and voting laws, a tangential subject that is mostly the prerogative of the state Legislature, and some staunchly argued in favor of the current partisan composition of the board, which they insisted maintains a balance and prevents one-party hegemony in elections. “I couldn’t agree more,” Van Bramer said in response. The city BOE falls under state jurisdiction, like all local boards of election, although the city gets to decide the board’s budget and not much else. The ten board commissioners are nominated by the county party machinery and appointed by the City Council. Representatives from the board testify at City Council hearings, usually during budget season, and receive recommendations and often admonitions from Council members, but are not bound to follow any Council mandates. The board is often seen as favoring the Democratic Party establishment, given that the vast majority of candidates for city offices are Democrats. Candidates not backed by the party machinery are often challenged in board proceedings and kicked off the ballot, though they are often first-time candidates with fewer resources and without experienced election lawyers. He continued, “Does the BOE have inefficiencies? Yes. It’s true of every agency in city government. There’s not a single agency in city government that’s free of inefficiency. So the notion that you would cite inefficiency as an excuse for fundamentally changing the structure of an institution is dubious.” Torres said he would oppose any measures that could weaken the party organizations’ role but conceded that the Council should “study the problem comprehensively” to determine the needs and inefficiencies of the BOE. There have been studies in the past, and each has found persistent issues. A 2013 report by the city’s Department of Investigations found a raft of problems in elections management as well as internal board administration. In 2016, the BOE was responsible for a massive voter purge in Brooklyn during the presidential primaries, resulting in legal action by state Attorney General Eric Schneiderman. In November, Schneiderman announced a consent decree with the BOE that requires added oversight of the board’s voter list maintenance. Less than a week before this year’s general election on November 7, city Comptroller Scott Stringer also released an audit that excoriated the BOE’s dysfunctional election operations. At each step, the BOE has pushed back and has been resistant to change. Even when Mayor Bill de Blasio offered a $20 million incentive for the board to enact major reforms -- recommending the empaneling of a Blue Ribbon Commission to analyze the BOE, more transparency in hiring and improved poll worker training, among other measures -- its commissioners refused. State-level BOE reforms have not progressed in Albany. Those who could take steps or apply pressure to improve the BOE’s abysmal record are the very people invested in the status quo, however, and the City Council, particularly its speaker, falls squarely within that dynamic. Election experts also tend to agree that the Council can pass little meaningful reform, absent legislative action at the state level, and that the bi-partisan BOE composition is appropriate. “In terms of patronage, it’s a bi-partisan agency, not a civil service agency. Unless that’s changed, the county organizations is where the commissioners and employees will come from,” she added. She insisted that most of the board’s employees are, in her experience, qualified and hard-working professionals. “As in any organization, some employees are better than others,” she said. And she warned that a civil service agency running elections could be open to political interference, while the current structure is designed to prevent just that. Steiner praised, in particular, the speed and accuracy with which the BOE provides election night results. But, she said, “they are less good at some of the work regarding candidates. I think the rules structure for candidates needs substantial revision.” Unlike the state BOE, the city agency doesn’t provide a public comment period for rules changes, she said, which often leaves the candidates and their campaigns unaware and unprepared. “The administrative rules are not as easy as the board thinks they are, and they’re largely a minefield,” she added. J.C. Polanco, a Republican who unsuccessfully ran for public advocate this year, has served as president of the city BOE and saw the problems first hand and attempted to fix them. He campaigned this year on a platform that included BOE reform. He’s blunt about the Council speaker candidates and why they wouldn’t speak up against the agency. “Each candidate has to try not to offend the county organizations,” he said. Though Polanco also agrees that the BOE’s partisan structure may be necessary, he believes it can be better. “One of the things to do is to professionalize the board,” he said, “by forcing every candidate to go through the crucible of the [Council’s] investigations process required of commissioners.” He favors merit-based hiring and called for it when he worked at the board. “There are professionals at the board that get a bad rap for the failures of the board to modernize,” he insisted, echoing Steiner. “You can definitely have a professionalized partisan agency.” The board should post positions with qualifications online, he said, and more publicly seek employees. “It would require an enlightenment of the citizenry and the board,” Polanco said. He also speculated about giving third parties representation on the board, proportionate to their vote shares in prior elections. While much of the conversation around elections and voting in New York tends to revolve around the state’s antiquated laws, there have been local attempts at such reform. 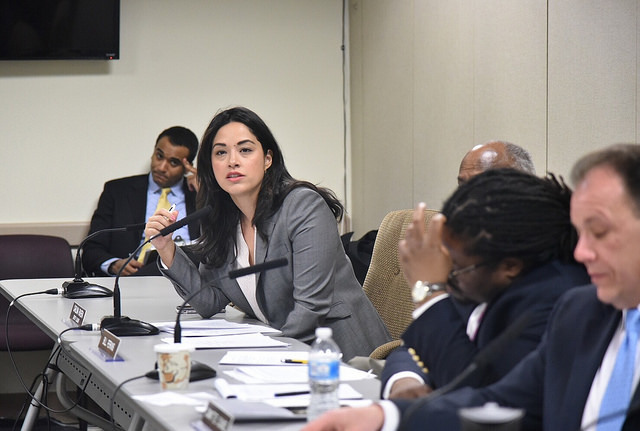 Council Member Ben Kallos has been a particularly vocal critic of the board and, as chair of the Council’s Committee on Governmental Operations, has pushed legislation that can improve elections and voting access. He has time and again urged representatives of the board to move towards merit-based hiring -- “I favor the civil service over the patronage appointment process,” he told Gotham Gazette on Monday. Kallos’ bill allowing online voter registration recently passed the Council. The mayor is expected to sign it into law, and it is considered valid under guidance from A.G. Schneiderman. At the last public forum in the race to become the next speaker of the City Council, seven of the eight men contending for the Council’s top leadership spot took turns making their argument for why they would be the right person to continue Speaker Melissa Mark-Viverito’s legacy of protecting and promoting the cause of women, transgender, and gender non-conforming New Yorkers. Though few new ideas emerged, for nearly two hours, the seven Council members pitched their progressive credentials and promised to champion the city’s underrepresented and underserved populations. Hosted by a coalition of 14 organizations, at Hunter College’s Roosevelt House Public Policy Institute in Manhattan, the forum capped off a post-election month that has seen the candidates appear at more than a dozen issue-focused debates and discussions on everything from criminal justice to government transparency and accountability. Thursday’s event was moderated by Politico New York reporter Laura Nahmias and Shatia Burks of the New York City Young Women’s Initiative. In attendance were Council Members Corey Johnson, Mark Levine, Ydanis Rodriguez, Robert Cornegy Jr., Donovan Richards, Jumaane Williams, and Jimmy Van Bramer. Ritchie Torres was the only candidate absent. Past was prologue as the candidates took turns briefly narrating their individual histories, giving tactful yet heartfelt answers while also lamenting the obvious irony of them all being men after 12 years of the City Council having women serve as speaker. Council Member Cornegy, who in recent weeks has risen to become one of the perceived frontrunners in the race, spoke as a family man, a husband and father of six. He noted his support for reproductive health bills in the Council, particularly one that created lactation rooms at city agencies that provide family services (he first opened a “lactation station” in his district office). He half-joked that he co-chairs the Council’s “men who get it” caucus. Johnson, another leading contender, reminded the audience that he is an openly gay man and the only openly HIV positive elected official in New York, and that issues related to transgender and gender non-conforming (TGNC) individuals are “deeply important” to him. He touted the passage of his bill allowing transgender New Yorkers to receive accurate birth certificates from the city. Richards echoed the sentiment, saying “it is shameful that there is not a woman in this race,” while emphasizing that not only would the next speaker have to focus on women’s issues, but also ensure that women are in leadership positions. Rodriguez cited his experience as an immigrant, in a large family with many sisters. “Women’s issues are trans-sectional,” he said, while promising to continue Mark-Viverito’s legacy. Van Bramer, who is also openly gay, spoke from the experience of his own coming out. Being an LGBTQ activist meant also being “an activist for choice and a woman’s right to choose,” he said. “The two of them are inseparable.” He proudly touted his successful efforts to open the first Planned Parenthood health center in Queens, and in helping found the first Girl Scout troop for homeless girls. Williams, who noted early that the seven would likely respond similarly to questions, instead emphasized that he is “battle-tested to move forward” and has passed the most bills of all the candidates. His statement would ring true as there was little daylight between the candidates as they addressed the issues raised at the forum including access to reproductive health services, education, economic development and workplace sexual harassment, NYPD policy, affordable housing, city budgeting, and Council governance. On abortion access and so-called crisis pregnancy centers -- which NARAL Pro-choice America calls “fake health clinics” that mislead women to block access to abortions -- all seven agreed that the NYPD should play a stronger role in both protecting women from protesters outside Planned Parenthood clinics and in cracking down on predatory crisis centers. Cornegy even floated the idea of a dedicated police unit focused on these centers. Johnson insisted that Planned Parenthood is always a budget priority for him. He said the Council needed to do more to “reign in” CPCs while calling on the police to be more vigilant to protect women seeking abortions at clinics. Levine said the Council needs to fight back against the demonization of Planned Parenthood, and use its budgetary resources to provide services for women and TGNC individuals. Should the Republican-led federal government cut contraception coverage, for instance, Levine said the city should step in to fund it. Richards, of Queens, said there was a need to fund services where “people are living in the shadows” and expand health centers to communities like his that are underserved. And he said the Council should fund local organizations that provide those services. Rodriguez urged continued support for Planned Parenthood and better reproductive education in schools. 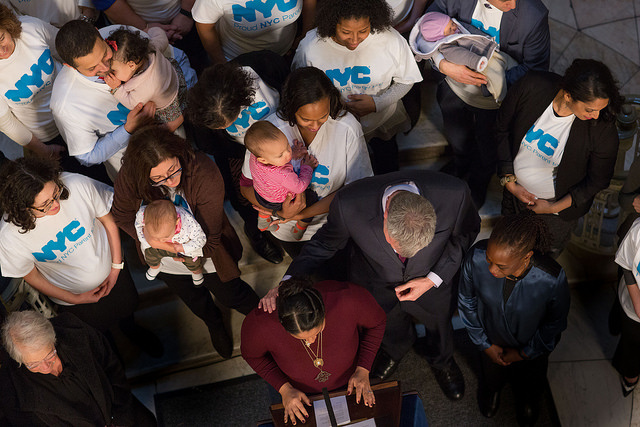 Van Bramer insisted that contraceptives should be fully covered and if they’re not, the City Council should fund them. Williams, who jokingly apologized that all the candidates were men, echoed his colleagues and said he looked forward to passing his “boss bill” prohibiting discrimination by employers based on workers’ reproductive decisions. The candidates varied little on their perspectives on providing a quality education in city schools, particularly for those that face greater obstacles in the system including students in foster care, low-income, undocumented and LGBT and GNC students. Johnson emphasized that schools should not be punitive, but rather supportive and rehabilitative. Richards, Levine and Rodriguez touted the virtues of community schools that provide wraparound services to students, including physical and mental health and social services. Levine raised the spectre of school bullying and its “frequent entanglement” with anti-LGBT prejudice, which he said the school system and city leadership have failed to acknowledge and address. Rodriguez railed against school segregation, and called for the launch of an “education civil rights movement” under the next Council. The issue hit home for Van Bramer, who admitted being “near-suicidal” and skipping school to avoid a constant barrage of homophobic slurs. “All of us have to make sure that that stops once and for all and all children are safe to go to school,” he said. Williams stressed a change in school curriculums to ensure the inclusion of people of color and LGBT and GNC people. Cornegy said school segregation and prejudice based on sexual orientation need to be tackled at the Department of Education, and he lauded the effectiveness of community schools as well. Given the current national climate on sexual assault and workplace harassment, it was only natural that the candidates for arguably the second-most powerful position in city government would be asked about their perspective on the model policy to deal with the endemic problem. Levine reiterated three proposals, which he announced earlier in the day, for rooting out sexual misconduct in city government through regular disclosure of sexual harassment claims by city agencies, a evaluation of sexual harassment policy and by elevating City Council staff complaints to bring them under committee oversight. Van Bramer also released details of bills on Thursday that would evaluate sexual harassment at city contractors and embargo those organizations with a history of misconduct. Another member with pending legislation was Cornegy, whose bill would require small businesses to detail what constitutes sexual harassment and provide hotline numbers for victims. Richards advocated a “zero tolerance” policy and said the Council should have its own independent department or agent to monitor sexual harassment. Rodriguez called for an entire agency to do the same citywide. Williams expressed support for his colleagues’ legislative efforts and candidly said, “The one thing we could all do immediately is believe” women’s stories of harassment. Johnson bemoaned a culture that allows men to believe they can act and behave in any way in a public setting because of their inherent power. “We have to change that,” he said. 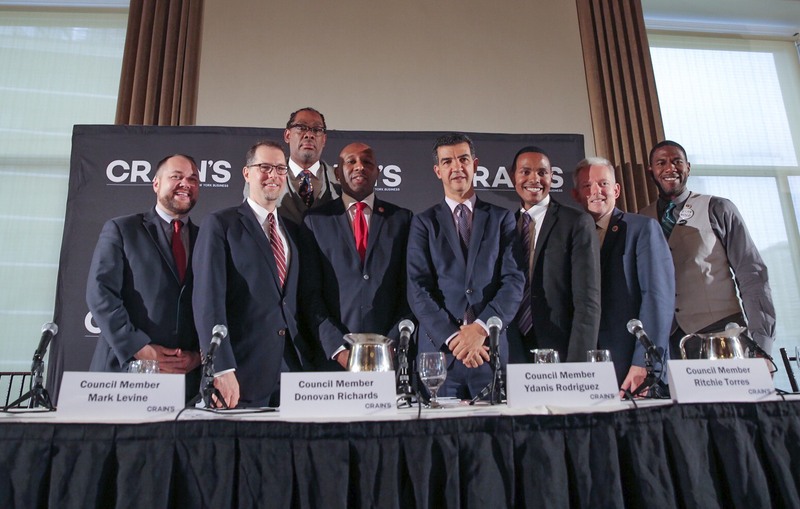 On changes to NYPD policy in interactions with LGBT and GNC New Yorkers, Richards and Rodriguez both stressed that the city needs to fully implement its body camera program and strengthen community-police relationships. Richards said the Civilian Complaint Review Board, which investigates complaints of police misconduct, needs more teeth to hold erring officers accountable. “That’s where the culture shift absolutely needs to happen,” he said. Williams touted his “demonstrable leadership” against the NYPD’s racially biased use of stop-and-frisk policing, and the Council’s Community Safety Act of 2013, which he co-sponsored. The act created an independent monitor for the police department and added protections against biased profiling by officers. Cornegy subsequently advanced the idea of characterizing negative police interactions with protected classes of people as hate crimes. Women, trans and GNC communities and domestic violence survivors are at greater risk of becoming homeless in the city, said Burks of the Young Women’s Initiative, seeking the candidates’ ideas on improving access to affordable housing. Again, there were only slight differences in the candidates’ proposals as they called for deeper affordability and more set asides for formerly homeless New Yorkers, while some emphasized increased services and resources for survivors of domestic violence. The 51-member Council will have only 11 women members in the next term starting January, down from 19 a few years ago, and has not had a trans member yet. In the current Council, debate moderator Nahmias noted, three women of color negotiate the city budget -- Speaker Mark-Viverito, Finance Committee chair Julissa Ferreras-Copeland, and Council finance director Latonia McKinney. Nahmias pressed the seven candidates on how they would ensure representation of cis and trans women, and women of color in particular, in their own senior teams and in the Council’s top leadership positions, namely the powerful chairs of the land use and finance committees. All the candidates were strongly committed to the task of choosing women and people of color as a majority of their senior leadership, and some said their staffs already reflect that commitment, though some rued the political reality that makes such a pledge necessary. “Women are 50 percent of the workforce and none of us deserves a gold star for making sure that women are in these positions and roles,” said Van Bramer. “It is appalling that there are only 11 women on the Council,” said Williams. The candidates all interviewed with the Council's Women's Caucus and made commitments to its existing and incoming members. Cornegy noted that hiring of people of color in the Council central staff had doubled in Mark-Viverito’s tenure, and he vowed to build on that by including women and trans individuals in particular. Danced around was the fact that the winning speaker candidate will likely have earned the backing of the major Democratic political organizations of the Queens and the Bronx, which will then have a lot of say in staffing and top Council leadership decisions made by the next speaker. Richards was possibly the only one to acknowledge that the speaker race will be influenced heavily by forces outside of the Council, including county party chairs and the mayor. He wouldn’t say who might be the finance or land use chairs under his speakership since “we all have power brokers that we’re talking to at play,” though he did promise to advocate for women to be chosen for those positions. Levine stressed the need to support far more diverse candidates for the Council in the 2021 elections, when nearly 40 seats will be up for grabs. Richards said the Council’s efforts need to go further, by making sure each city agency has diverse staff, by hiring gender diversity compliance officers and ensuring that women of color and trans people move up into managerial positions. In a brief lightning round, all seven candidates agreed to staff their senior teams and central staff with more than 50 percent women and TGNC individuals, committed to support and expand the Young Women’s Initiative, and said they would back the “Solutions out of Struggle and Survival” policy proposals identified by numerous TGNC advocacy groups. With the last of the speaker forums, the public-facing aspect of the speaker-selection process appears effectively over. Candidates will now spend much of the next few weeks in backroom negotiations and closed meetings before the next speaker will be chosen in January when the next class of the City Council convenes. The partner organizations for Thursday’s forum included: Girls for Gender Equity, Women of Color for Progress, Brooklyn Movement Center, The Lesbian, Gay, Bisexual & Transgender Community Center, PowHer NY, Planned Parenthood of New York City, National Organization for Women-NYC, New Leaders Council--NYC Chapter, National Institute for Reproductive Health, The Brotherhood/Sister Sol, Campaign for Black Male Achievement, Citizens’ Committee for Children, Eleanor’s Legacy, National Association of Social Workers—NYC Chapter.